Celebrating the appearance anniversary of Varaha avatar. 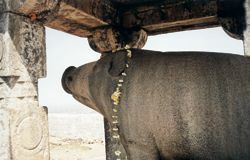 Varaha is Krishna appearing in the extraordinary form of a gigantic boar—gigantic enough to carry the Earth on His tusks. Sound amazing? It is. And why should the activities of the Supreme Personality of Godhead be anything less than supremely amazing? Krishna.com is not devoted to discussing the ordinary activities of average people. Dying to find out what happens next? Read the entire pastime—from our online Srimad-Bhagavatam—here. Below is a photo of an uncommon Deity of Varahadeva, worshiped at Rama Giri in India. 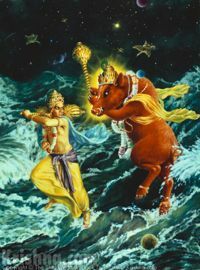 For an entertaining and in-depth analysis of the phenomenon of Krishna's many mysterious appearances on Earth—including His Lord Boar incarnation, check out When God Descends by Ravindra-svarupa dasa. What do people do to celebrate Varaha's appearance day? 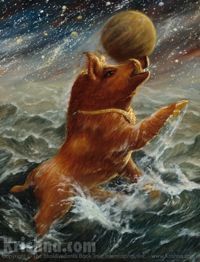 "To celebrate the appearance of Lord Varaha, the Lord as a giant boar who lifted the earth with His tusks, the children play “Stick the Earth on Varaha’s Tusks.” Some years we have groups of students make a picture of Varaha and the earth and then play the game with the best picture. Last year our grown daughter drew Varaha, and the students competed for the best earth drawing. Then, blindfolded, each of us tried to tape the earth as close as possible to the tips of the Lord’s tusks. A simple prize awaited the winner." Ready to play Stick the Earth on Varaha’s Tusks? Please capture your game on video and send it to us immediately. The world needs to see how it's done.